*Your 7-day Free Trial begins when the Download Instructions email is sent. Simply cancel anytime during your 7-day Free Trial, and you will not be charged. If you are enjoying your 7-day Free Trial, do nothing and your subscription will automatically continue at the monthly rate of $10.95/month. The 7-day Free Trial offer cannot be combined with any other offer. Limit one per household. First-time customers only. A valid payment method and an internet connection are required. Can I sign-up without a valid payment method? Sorry, not at this time. A valid VISA or MasterCard payment method is required. Once your credit card has been validated (charged $0.01), you will granted access to all the trial software via email. What does the 7-day Free Trial include? 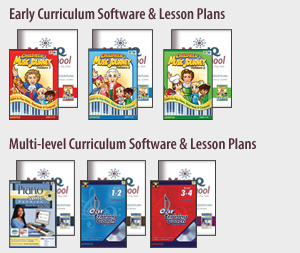 Access to all the MusIQ HomeSchool software for both the Early and Multi-Level Curricula (listed on the sidebar). How will I receive the 7-day Free Trial? How do I sign-up for the Monthly Subscription? Do nothing. The 7-day Free Trial upgrades automatically to the Monthly Subscription ($10.95/month) unless you cancel before the 7-day period ends. PLEASE NOTE: Your first Monthly Subscription automatically begins 7-days after the trial period ends. The second charge is on the same calender day of the next month and each subsequent month until your Monthly Subscription is canceled. Example: If your 7-day Free Trial began on March-10, and you don’t cancel your account, on March-17 your credit card will be charged $10.95. On April-17, the $10.95 will be charged again and subsequently each month until your Monthly Subscription is canceled. How can I cancel my 7-day Free Trial? I requested a 7-day Free Trial, but never received a confirmation. Chances are the Download Instructions email went to your junk mail. Add the email address subscription@adventus.com to your email client safe list. Also, check to be sure you sent us your correct e-mail address.